They are called Joy and Chencho, she is from Canada and he is from Barcelona. The couple met each other when they were working together, and even though they had a long distance relationship due to the fact that she was living in Germany and he was in Spain, they fought for love and she moved to Barcelona after some years. We have been witnesses of this love story by organizing the wedding of their dreams! They chose Andalusia because most of his family members live here. The couple was looking for something autochthonous since her family was going to do a long distance trip; therefore, they wanted to make it really special for them and we helped them out! 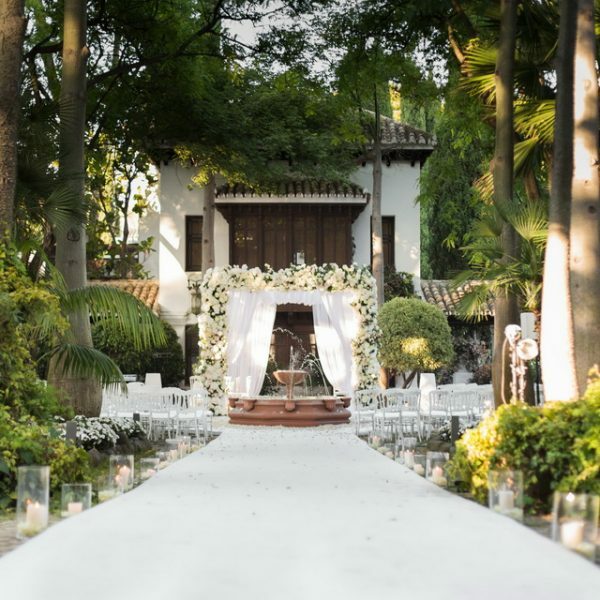 The chosen place was Cortijo El Lagarillo , an exclusive typical Spanish country house located in Malaga; and the catering services were provided by Alabardero Catering. The decoration was planned based on blue, green and white hues, trying to match venue and tradition. We focused on having plenty of different chairs: Sevillian chairs, the typical chairs found in a country house, and brown Tiffany’s chairs. This gave a special but simple ambience together with the elegant touch of the blue hydrangeas. The whole scene looked just perfect! It was 28th of June, at the beginning of the summer, one of the couple’s friends officiated the lovely ceremony while a guitarist was harmonizing that unique moment of their lives; it was very touching! The altar was made on a wood structure and decorated with a white smooth fabric, a really simple decoration specially requested by Joy, the bride. We also added a wooden table from the country house. It was definitely very classy but gorgeous! Upon arrival, all guests were given wooden fans, personalized missals made by Nulki Nulks and handmade little bags decorated with a blue bow that contained olive leaves bits; we like taking care of the ecosystem! Joy, the bride, arrived with her elder son and they were preceded by the groom’s niece who was holding a personalized placard made of wood with a white inscription that said: uncle Chencho here comes your Joy. Isn’t it a great idea? After the ceremony, all guests were escorted to the garden where the cocktail was served. We prepared imprinted tiles with the menu in both Spanish and English, so the guests could know what they were eating. We wanted that every single detail matched both the chosen venue for the event and the type of wedding. We put a lot of effort to make it different to the rest of weddings that can be seen on blogs and websites. The flower arrangement was all organized by Virginia Floristas, who once again, used mud flowerpots and colors that matched the Andalusian style. The dinner was organized as a cocktail reception with buffet stations of Iberian ham, salads, different kind of rice and a barbeque, yummy! We avoided the use of boards to display the menu and we kept the idea of using blue tiles. A great thought that Nulki Nulks helps us to implement. A flamenco music band harmonized the lovely event. We arranged an area with some tables in order for the guests to seat down. We placed long tables, very characteristic from Spanish fairs, as well as with the intention of creating an easy flow of the service during the dinner time. Once again, we combined chairs and table linen of Pedro Navarro. The lighting, of course, was done by Chez Vous. After dinner, the dance floor and open bar were ready to impress all guests in the interior yard. We prepared an area with comfortable white sofas and blue cushions and female guests were given straw shoes as a gift. We cannot forget to thank Joseba Sandoval and Nulki Nulks for the beautiful pictures that were taken during the wedding. A lot of work that it was worth everyone’s smile! It is been a pleasure to work with this amazing couple, Joy & Chencho, and have the opportunity to organized this wonderful day for them!